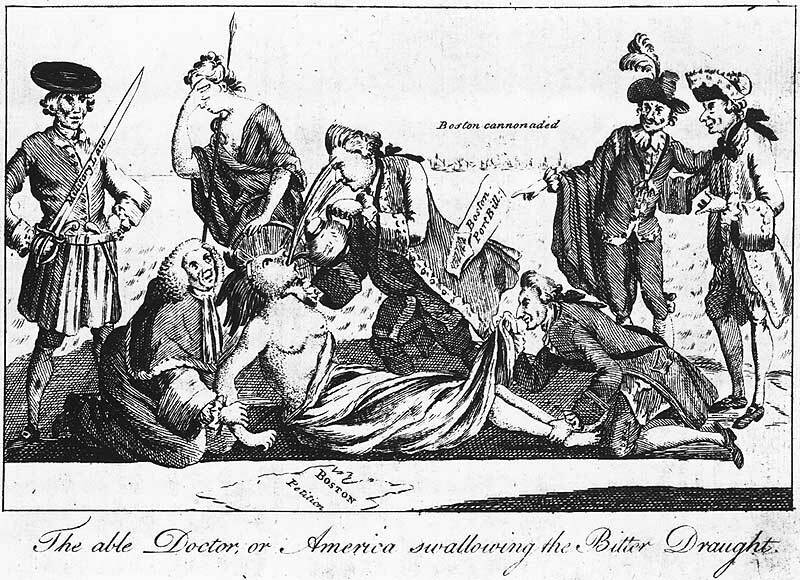 The Able Doctor, or America Swallowing the Bitter Draught. 1774. London Magazine. British Cartoon Collection. Following the colonists’ defiant display at the Boston Tea Party, the majority of England was surprised, bewildered, and angered by the colonists’ actions. After much debate in the Parliament, King George III assumed an active role in deciding punishment for the rebellious and costly colonists by personally advising Lord North, the Prime Minister of Britain at the time. This resulted in the “Coercive Acts,” passed in March 1774, which were intended to quell the colonists and force them into submission. There was some opposition in Parliament to these acts by American sympathizers, including concerns that the balance of governmental power in England would be disrupted by the King’s influence over Lord North. One of the more prominent American sympathizers was Edmund Burke, a statesman and leader in the conservative Whig party, who warned that such punishment would only invoke a “fierce spirit of liberty” in the colonies. Those members of Parliament who sided with Burke invoked many of the arguments employed by the Patriots, stating that it was morally wrong to tax America without representation in the Parliament. Description: Closed off the port of Boston, eliminating commerce and trade in the city. Description: Granted a change of location to Great Britain or a British colony in the event of a jury trial. Description: Limited colonial power and reinstated royal governance, including outlawing freely called town meetings and elected positions. Description: Allowed new governor General Thomas Gage to house British soldiers in private homes, inns, and other buildings without permission from colonists. Description: Designated western region north of the Ohio River as part of Quebec and made Roman Catholicism the established religion of Quebec; this upset colonial Protestants.